It was no more than two months ago I started with running. The beginnings were hard, I felt winded after several hundred metres, but with time I got more used to it and could cope with longer distances. 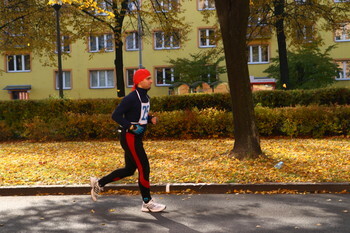 My colleague from work, Vojta, talked me into signing up for a quarter marathon in Ostrava. The distance 10 548 metres was a big challenge for me, mostly because I had never run so long track before. On the race day (last Friday) I felt ready. My target was simply to finish it, I did not care about time, just about beating the distance. The track was set up on the main street in Poruba, which was closed to traffic due to this event. Almost six and half laps on the almost flat tarmac seemed scary from the starting line, but I was in a good mood. First two laps were hard. At first I had trouble maintaining my pace, it is quite easy to chase someone faster, but to endure and not burn out while doing that, that is another chapter :). From the third lap I found my comfortable pace (although the meaning of „comfort“ was very shifted here). In my last lap I was almost alone on the track, but I felt some surplus of strength and ran faster a little, ending with exhausting finish with heart-rate near 190 (word comfort did not apply any more ). I finished with time 1:02:40, which was far beyond my expectations. I was very happy about that, because my guess was about 1:20:00. I got a diploma and a participant's medal and went home. The race was really a unique experience for me, the atmosphere was just great. For sure it was not my last one. Saturday was a very nice and Sunny day. 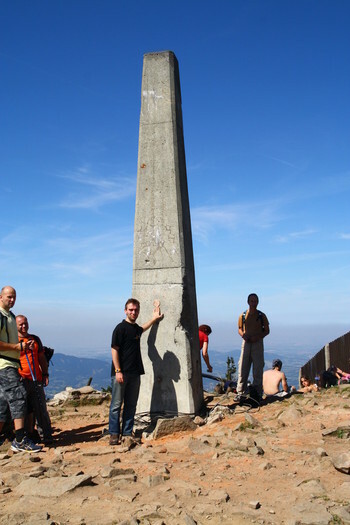 I did not have any plans for the weekend, so I decided to go to the Lysá mountain, where I have not been for some time. The journey to Ostravice, where the path starts, was quite ok, but I had to change bus and trains three times. From Ostravice to the top I felt more like in procession, not hiking. So many people decided the same program for Saturday . When I reached the top, I wanted to take lunch or something to drink. Queue of fifty people discouraged me to do so and old crackers and hot water had to do the job. I took some pictures and headed back down. 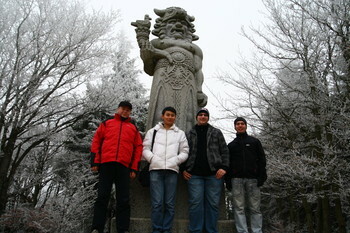 It was a very nice trip, the weather was good also, maybe too much sunny. Generally, I was satisfied with the achievement of reaching the top. However, next time I will choose a less crowded mountain . 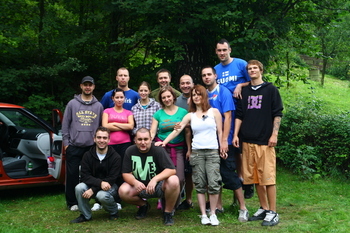 My friend and co-worker Aleš is getting married very soon, so this Monday he organised a small party. 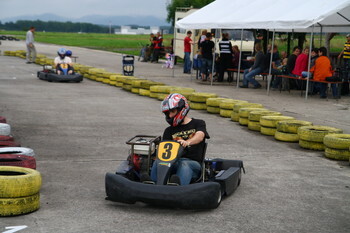 Food and drinks were present in a great quantity, but the main attraction were certainly the go karts . We all raced a lot: from the careful beginnings to the aggressive collisions in the end, when drivers were fuelled with beer and home-mode Slivovice. The party was awesome, definitely a success. Thanks again, Aleš. As I wrote before, I had finished my thesis and passed the state exam. Today it was the graduation ceremony, the final moment of my studies. Before it began we went through a quick training session, in which they taught us, where to walk, what to do and all the stuff needed for the ceremony. Then they put caps and robes on us and the „real thing“ started. The ceremony certainly had its pomp and was a decent way, how to say goodbye to the students that spent many years and went through all fun, hard work and trouble connected with the studies. I think we all enjoyed it and felt relieved we had made it that far. After 19 years of school attendance it is finally over. Yesterday I have defended my thesis, passed the state exam and thus have become an engineer of information systems. The last weeks, when I was studying and stuffing all kinds of information to my head, were tough, but paid off. Thanks and best regards to all the people that had to survive the time with me . I still have not fully realized what I have done and accomplished, but it will probably come to my mind when I catch up on the sleep deficiency I have got now . Less than two months ago, my parents moved to the village of Olbramice, 20km of Ostrava. Since I have not god my own apartment yet, I moved too. 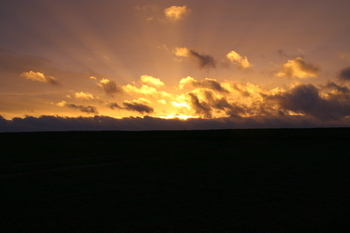 And yesterday, I had a great opportunity to take pictures of a beautiful sunset and a rainbow at the same time there. Enjoy the pictures.